Evolutionary, rather than revolutionary, current network interface cards offer increased speed, better CPU utilization and specialized functionality. IT’S HARD TO ARGUE with the notion that network interface cards (NICs) have become commodity items, especially in the SOHO environment; but most large companies still try to insist on a uniform manufacturer, or close to it. Despite this, there are the inevitable lesser-known NICs that escape IT surveillance when users bring in laptops, unauthorized desktops, and bundled or integrated NICs, or create wireless LANs. The new features described in this article may be enough to allow the top-tier manufacturers to garner a premium price as well as access to the corporate boardroom. The second tier has done a good job of keeping close in terms of performance, but the products lack some of the specialized, higher-level features. Except as noted, all the gigabit adapters are backward-compatible with 10- and 10/100-based networks. All of the 64-bit adapters are backward-compatible with 32-bit slots, but some older PCI slots may have too much “lip” to allow the far edge of the card to overhang. The 64-bit cards are also a little bit longer than the 32-bit cards so, in addition, you must have board clearance to allow the 64-bit card to seat properly. Additional ports on the same card, sometimes permitting trunking for greater combined throughput or additional fault-tolerance. Offloading of various functions to the Application Specific Integrated Circuits (ASIC) on the NIC rather than the CPU. Even at today’s CPU speeds, offloading of encryption or stack functions improves CPU utilization as well as network throughput because at least a whole cycle of communication with the CPU (and its subsequent interrupt) is saved. Gigabit speed over standard cables and the ability to auto-detect what kind of connection is on the other end. This means no need to stock crossover cables. A higher level of integration in NIC construction. This is partly what led to a general price depression; but, more important, it should give much higher reliability, less heat and greater throughput than the older generation of cards. The 3C996B-T is a well-constructed card, on a two-layer, two-sided printed circuit board (PCB), with a 64-bit Peripheral Component Interconnect (PCI) connector. It’s backward compatible with most 32-bit slots. This card, in an appropriate PCI-X slot, will outperform the older, more expensive 3Com gigabit NIC with 1MB of external memory, according to 3Com. There are four annunciators (lights) on the back of the card to aid in troubleshooting. The ASIC, a collaboration between Broadcom and 3Com, in the 3C996B-T has an integrated buffer and performs duplex flow control. With a single pair of connections (multiplied by a set number of virtual endpoints), the 3Com card returned the second highest throughput of the cards I tested (see the sidebar). With multiple pairs, the 3Com card again placed second in throughput. The total throughput increased with more pairs of connections, indicating a well-made, high-performance card at a good price. 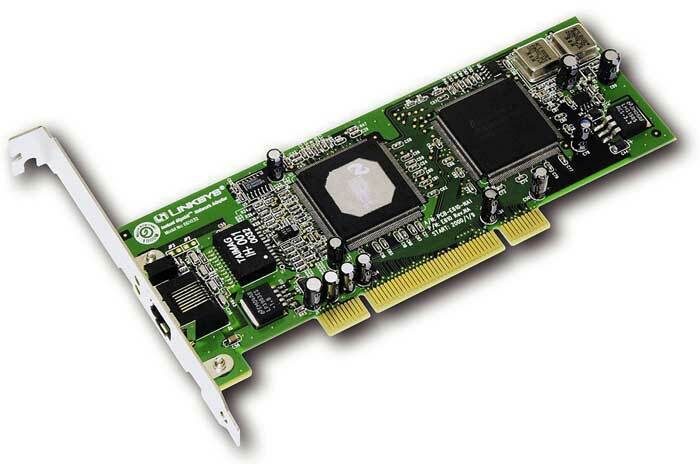 This card requires a PCI-X1.0- or PCI 2.2-compliant bus. Most major OSs are supported. As with most NICs in this roundup, detailed instruction comes via software on CD. 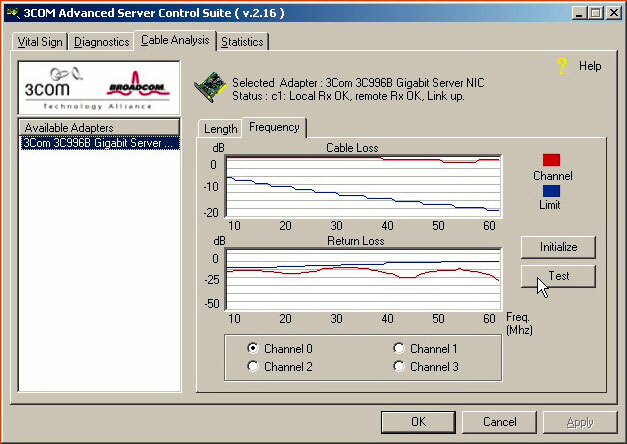 3Com includes a Connection Assistant to aid troubleshooting and various management programs, including a server control suite (Figure 1) that provides diagnostics, as well as a cable-analysis program that measures cable performance (in Hertz and dB attenuation per distance). Of all the boards reviewed here, the Pro/1000 (PWLA8492MT) has the highest level of integration. There are no capacitors of the “cap” type visible—there’s an Intel ASIC, a large IC, a power transistor, two tiny op-amps and a crystal. The magnetic “phy” circuit and box, visible on every other card, is hidden (most likely in the two RJ-45 sockets that extend onto the board). Unfortunately, the annunciators and signal lights are also placed on the outside rim of the RJ-45 sockets, leaving room for only two lights per socket, though they are double colored. With multiple pairs of connections and both ports active, this Intel NIC averaged a whopping 643Mbps. This is also a 64-bit board, with compatibility ranging from PCI-X, 133MHz, to standard PCI 2.1, 33MHz. As with the 3Com card, I tested these cards in both slots. They even fit in a very old Intel motherboard, but not the old Biostar. Both 3Com and Intel operated flawlessly. Except for a modest difference in throughput, the 3Com card comes with more inclusive management utilities, though the Intel card supports DIM (think Intel LANDesk) and Wired for Management (WIM). When more than one Pro server NIC is used, Intel supports load balancing. The SMC9462TX is a 64-bit card supporting up to 66MHz slots. It’s also well laid out, but is somewhat of a hybrid. It consists of two large ASICs, some high-quality metal capacitors, a socket for PXE boot, with much of the other tightly integrated surface mount components in a partial two-layer, double-sided trace board. It also has my favorite utility: five annunciators on the back of the card, visible even when the cable is plugged in. The lights cover speed (10Mbps, 100Mbps and 1,000Mbps), with separate activity and link lights. The drivers come on a floppy disk, which also holds some documentation, most of which is also contained within a slim booklet. This card ran very cool, probably the coolest of all. SMC provides a lifetime warranty. Figure 2. SMC’s EZ Card 1000 Gigabit Ethernet PCI Network Card averages a blazing 428Mbps in performance. With one pair, the SMC card averaged 482Mbps (Figure 2), but with multiple pairs averaged 428Mbps, peaking at between 47 percent and 57 percent of processor time. This contrasts with the Intel entry, which averaged in the high 20s, and the 3Com, which peaked in the 30s. Linksys provided lots of equipment for testing, but because I had a 64-bit capable server, I elected to mix a 32-bit card (the 32-bit slot EG1032) at one end point with a 64-bit card, the EG1064T, at the other. Although, with one paired connection, the throughput was low (154Mbps), the CPU utilization was the lowest of any gigabit cards tested—a miserly 7 percent on the dual Athlon MP server. On the endpoint single Athlon, utilization was at 14 percent, never rising to more than 27 percent for 20 pairs. Contrast this to the Intel gigabit entry, for which I recorded CPU utilization on the dual Athlon MP of 20 percent average for 20 pairs, but a high 97 percent to 99 percent CPU utilization on the single Athlon server. If you plan to run gigabit cards on a server that will do file and print processes, especially large file transfers, you’ll want to have a good excess of processing power. Also, a workstation will devote significant portions of its processing power to handling the transfer. In both cases above, for Linksys and Intel cards, the default offload Tx checksums was enabled. To further investigate the seeming disparity regarding the Linksys pair, I tested multiple sets of pairs. At three pair, I recorded 371Mbps; at five pair, 475Mbps; and at 10 and 20 pairs, 621Mbps. As the Linksys pair is stressed by high demand and simultaneous operations, the throughput actually increased considerably, bringing it within range of the top-performing Intel and 3Com entries (Figure 3). The Linksys drivers ship on floppy disks, but included a great manual—a slim, detailed booklet. For those of us who dislike manuals, Linksys provides a handy, one-page quick start card for each common OS. (Why don’t more manufacturers do this?) The Linksys card appears to be a hybrid design somewhat similar to that of the SMC gigabit card: one of the ASICs has a heat sink, but didn’t get unusually warm during testing. There are only two annunciators, as well as several poly “caps” scattered throughout the two-sided trace board. NetGear advertises that the GA302T runs on standard Category 5 cables and has auto-negotiation to determine if the card should emulate a crossover cable. I used Category 6 cable for the testing. Although the card is compact, the first thing one notices is the large heat sink over the Broadcom ASIC. The board itself became quite warm to the touch. As if to throw salt at top-tier and other manufacturers, the graphic on the box back claims throughput numbers showing NetGear besting both a similar (but not the same) Intel card and a D-Link entry. The power transistor is enveloped by a comparatively large heat sink screwed to the board. The board appears to be dual-sided, at least for the traces, and there are two wires covered by epoxy running from the MagTek magnetics chip, indicating a later engineering change. There’s even a ceramic disk capacitor soldered to the board, though most of the components appear to be wave-soldered. NetGear warranties its products for five years and includes a CD of driver support, along with a quick start poster. Although I used shipping drivers for all the other cards, I did update the driver for this card from the NetGear Web site. With five pairs, the driver for this card consistently generated a bluescreen when running Chariot, a performance-evaluation tool. With the second driver and one pair of connections, I generated an average throughput of 378Mbps and 45 percent utilization, and three pair returned 389 Mbps and 46 percent utilization, both respectable. At five pair, and the high throughput script, one of the endpoints failed in a bluescreen, indicating driver failure. In attempts to track this down, I ran many other scripts, including the throughput script, which writes a much smaller file and all the Microsoft scripts I could find. None resulted in a bluescreen, but when I increased the size of the message contained in the Exchange script by a factor of three, Chariot would fail near the end with more than five pairs, indicating a TCP connection failure. Interestingly, the Chariot trace shows that the throughput periodically dips before recovering, then quitting. When running very large file transfers under my simulated heavy loads, the drivers appear to have a TCP ack communication problem. With smaller transfers and moderate loads, there was no evidence of any problem; the throughput, under certain conditions, was much higher than I indicated above. To be fair, the conditions I created may not exactly simulate real-world conditions, and a NetIQ white paper states that simulating large numbers of clients with few endpoints may lead to TCP ack failure. Nevertheless, the other entries tested showed little evidence of any problem. Most of the 10/100 cards showed similar performance. Obviously, with a larger test bed, you’d expect differences to become more significant. There are at least two outstanding entries here, however. Even though the Adaptec Quartet66 (ANA-64044) is only a 10/100 64-bit, 66MHz card with four ports in one slot, it provides great flexibility. With the included software—Duralink64 Failover—it’s possible to have one link take over for a failed link. I tested this, and it worked as designed. I didn’t have the opportunity to test the next feature: the possibility to trunk not only all four ports in one card (tested), but an aggregate of three ports’ worth of cards together, up to 1.2GB. In addition to failover for Ethernet link loss, you may set watchdog timers, abnormal hardware interrupt, too many collisions or abnormal counters to trigger a failover. As with 3Com, the number of operating systems supported by this Adaptec Quartet66 is enormous, even supporting Windows 95 OSR 1. The Quartet also supports both 3.3 and 5.0 Volt PCI slots. All documentation comes on a CD, along with the drivers and some impressive management utilities. There are three other versions of the Quartet66, with varying port densities and varying PCI speeds supported (33MHz or both 33/66MHz). This Quartet66 is neatly laid out, with four ASICS next to four other ICs, which are dual-layered, double-sided and all neatly integrated. For four ports, there are only two annunciators each port, which is a disappointment. When I trunked all four ports together via Duralink64 Port Aggregation, I could theoretically generate 800Mbps, 532Mbps nominal, claimed by Adaptec. With the severe tests from Chariot, I generated in the middle to high 300s, depending on the test, well within the claimed range considering Ethernet inefficiencies. This card also supports Cisco Fast EtherChannel. For Port Aggregation to work, you must use a switch at the “hub” point. The Quartet reminded me of my old favorite, a Mylex four-port, 10Mbps card, but with better utilities. Rumor has it that Adaptec will be coming out with a gigabit version of this card. This model card is also the only one in this series to fully support iSCSI, so it would be useful for small- or mid-sized SAN or NAS connectivity. The 3CR990-TX-97 and 3CR990SVR97 cards, with a 3Com 3XP ASIC processor, are used in concert—one at the server, the other in the workstation. This model boasts 168-bit encryption or “triple DES” and is intended to run an embedded firewall. An additional box includes the firewall software. The advantage of running the software on the NIC is that this frees up the processor, as well as provides an additional level of security at the actual servers and workstations in use. The firewall can also be configured to stop certain attacks originating from within the enterprise. In typical 3Com fashion, this can all be managed from one console, as the management utilities are included. As an example, one of the 3Com manuals describes, in simple terms, how to create a no ping policy to prevent hackers from basic network discovery. In the policy server, under the management utility with the Firewall policy server, you simply select a NIC, click on the Policy tab at the bottom of the screen, and click on the Create Policy icon. A wizard guides you through selecting Deny ICMP and the proper direction, which blocks ping attempts. 3Com also provides a “standard Windows 2000 rule set,” which will block Nmap and Ethereal, as well as provide resistance to Nimda and Code Red. The policy is associated with the NIC, which is simple to accomplish through the wizard. For performance testing, I created some rule sets and measured modified performance with Chariot and QCheck. Results were in the same ballpark as my older 3Com NICs, so the idea of embedding the firewall functionality within the ASIC NIC processor does save CPU time and, under my conditions, didn’t appreciably affect performance. This solution would be most useful for small- to mid-sized companies where state-of-the-art firewalls aren’t in place or not updated regularly. My test bed consisted of servers and workstations with a variety of motherboards—Iwill, Intel and Biostar—and a mixture of CPUs (both Intel and AMD, from 450MHz to 1800+MHz). All computers had at least 192MB RAM (most were from 256MB to 512MB) and ran Windows 2000, 2000 Server or 2000 Advanced Server at Service Pack 2 or 3. I used a D-Link gigabit switch and a 24-port 10/100 switch with two gigabit ports from Linksys (www.linksys.com). Though some NICs claimed to be able to do gigabit Ethernet over Category 5 copper cabling, I wanted to eliminate cable crosstalk and, particularly, attenuation as a variable. With the exception of two crossover cables, which were Category 5e (Belkin, www.belkin.com), I used Belkin Category 6 cables exclusively. For throughput tests, I used NetIQ Corp.’s Chariot (www.netiq.com), a complex, script-driven, performance-evaluation tool used by many NIC manufacturers and is capable of simulating large environments with very few workstations. A variety of ready-made scripts available on its Web site simulates different application mixes. You have to install an endpoint that runs as a service on each of the pairs you test. NetIQ doesn’t recommend that you install the Chariot manager portion on a computer that’s part of the testing, even if you run the manager from a command line. An ancillary program available from the company’s Web site permits the creation of up to hundreds of virtual IP addresses per network card (setaddr). Another utility (connect_em.exe) creates open TCP ports. I typically used between three and 50 pairs in my testing and used two scripts: a Microsoft script and a high throughput benchmarking script. NetIQ’s Web site provides a useful utility that uses some of the same endpoint principles as Chariot, for a free download (7MB-plus), called QCheck. QCheck gives single numbers that reflect average throughput performance, as well as testing connectivity. I also used NetBench 7.0.2, from www.etestinglabs.com. Because some of the gigabit cards were capable of using 64-bit PCI slots, as well as the Adaptec four-port card, I needed a server with 64-bit slots. Desktop computers typically have 32-bit, 33MHz PCI slots, even those adhering to the most recent specification, PCI 2.2. Higher-end servers usually have a PCI-X slot, which is a 64-bit slot capable of speeds up to 133MHz, but will support 66MHz and 33MHz. AMD vs. Intel processor (www.amd.com)—The only 64-bit slots I’ve seen on Intel boards were those that supported dual Xeons, which are pricey. I selected an Iwill MPX2 motherboard (rev 1.4) because it provides two 64-bit slots, high performance, good ancillary utilities and has received very good reviews. Iwill’s MPX2 (www.iwillusa.com)—It supports two AMD MP processors, and I used two 1800+ MHz samples from AMD. The newest BIOS from Iwill supports at least MP 2200+. Kingston DDR memory (www.kingston.com)—Experience has shown Kingston to be reliable. There are or will be other motherboards that support faster memory (for example, many of the Intel motherboards support either Rambus or DDR memory that lets the front side bus run at 400 or 533MHz), but it wasn’t my goal to optimize front-side bus configuration. Antec case (www.Antec-inc.com)—The SOHO 1080AMG Performance Plus includes a massive, powerful, 430-watt power supply that has the bonus of being quiet. In fact, the whole case, with its three other fans, ran more quietly than the D-Link gigabit switch. The side of the case fan is directly over the AGP and one of the 64-bit slots. As some of the NICs ran extremely hot, as measured by CompuNurse, the side fan location is perfect. Of course, the case is easy to assemble and has other great features, but one of the best may be the price ($159). Western Digital Special Edition Ultra ATA 100, 80GB, 7200 rpm (www.westerndigital.com)—I thought I only wanted a 133ATA drive. Western Digital’s Special Edition ATA 100 drives, with an 8MB cache, are probably faster, though a recent claim that they’re as fast as my other, comparable SCSI drives is almost certainly exaggerated. 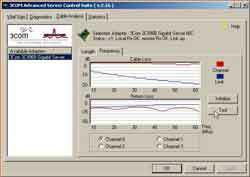 SiSoftware’s Sandra Pro utility (www.sisoftware.co.uk)—A free basic download, the Pro version verified that this drive is very fast, close to single-task SCSI performance. ATI All-In-Wonder Radeon 8500 (www.ati.com)—It may be overkill for a server but most servers and server motherboards from a wide variety of manufacturers use ATI’s Rage chipset for video. The chipset is only available now to OEMs. If you haven’t looked at NICs in the last few years, you’ll find these cards to be more evolutionary than revolutionary, but include some “very good to have” features. Top-tier manufacturers usually provide management utilities with the hardware, and support was good across the board for these manufacturers. All of the cards I’ve described here work well and improve throughput and response in most settings. In moderately sized environments needing firewall functionality, the obvious choice is the 3Com 3CR990 combo. In niche settings, my absolute favorite is the Adaptec Quartet66—more ports are better—but if price is a consideration, make sure you need the additional functions. Larger and high throughput areas should move to gigabit-over-copper to maintain the cable plant; my choice there is either the 3Com or Intel entries. Though Intel has slightly higher throughput and dual ports, my favorite is the 3Com NIC for all the management utilities it includes. When considering your next NIC purchase, be sure to carefully consider who has, or will have, .NET support. Even though you may not even be thinking about another migration, the average NIC lasts four years or more, even in corporate environments. The incremental cost to purchase higher-performance cards for later application will save time and money.